I’m happy to announce the winner Connie Arnold’s poetry collection, Abiding Hope and Love, is Brenda LaVelle!! 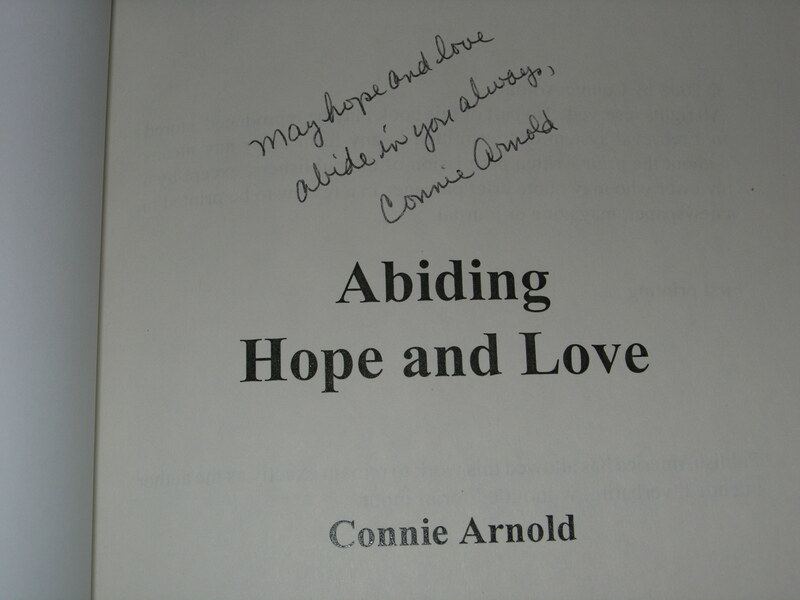 I’ve emailed Brenda about where to send her autographed copy of Abiding Hope and Love. If you didn’t win this giveaway, I’m sure Connie will be touring again for her poetry collection and you’ll get another chance. You can keep up with Connie’s news on her web site – Inspirational Poetry of Connie Arnold. If your taste leans towards fantasy, you may want to meet author Rhonda Parrish whom I interviewed earlier in the week. She also wrote a guest blog post about secondary characters that is worth reading. 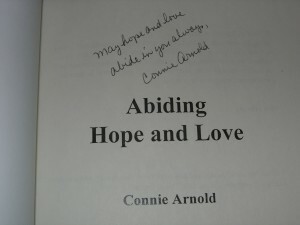 Connie Arnold has graciously provided a signed copy of Abiding Hope and Love for one of my lucky readers. All you have to do to enter is leave a comment between now and Wednesday, April 29th at 11:30pm Eastern to let me know of your interest. This is open to international postal addresses. The winner will be picked using the randomizer available at random.org. Here are two poems from the collection – “Melody and Harmony” and “Love Can”. Connie Arnold is the author of two poetry collections – Beautiful Moments of Joy and Peace and Abiding Hope and Love. She lives in North Carolina with her husband Tom, and they have two children and three small grandsons. Connie lives with the daily challenges of lupus, and the pain and weakness it causes. I was fortunate enough to interview her via email while she is on her blog tour for Abiding Hope and Love. Her web site is at Inspirational Poetry of Connie Arnold. Amber: I read on your site that you began writing poetry as text for choir music. Do you remember having an “ah ha!” moment where you thought to yourself, “I’m writing poetry!”? Connie: No particular “ah ha!” moment comes to mind as such, but looking back it’s obvious that the text of many of the songs I wrote could stand alone as poems. Usually the words would come to me first, and I would compose music that fit with the words. When I first drew a blank on attempting to come up with a melody to fit what I wanted to say, that might have been the turning point where I was writing poetry and occasionally would compose music for a certain poem that seemed to sing to me. Amber: Do you write in the same place such as an office or coffee shop? Connie: Not all the time. One place I write most often is at the dining room table. That’s where I get my best start on poems often, when I’m eating. I guess food fuels my brain to be more receptive to inspiration and think more creatively! Amber: You have two published books of poetry. How do you decide which poems to include or leave out? Connie: The first book, Beautiful Moments of Joy and Peace, includes my earliest poems and other more recent ones that fit with the theme. The second book, Abiding Hope and Love, has various poems on different themes, that when putting together I realized could be grouped into six categories of Hope, Love, Children, Music, the Bible, and Nature, with hope and love being the dominant themes throughout. Amber: How do you feel your style has changed or developed? Connie: My style has developed to include more different forms of poetry. There is more variety in the second book than in the first one. Amber: Do particular themes keep appearing in your poetry? Connie: Yes, in earlier poems the themes were of beauty, joy and peace which changed to an emphasis on hope and love for the second book. Since then I have two more collections in the works, one with themes of grace and comfort, and the other poems of seasons with an emphasis on music. Beauty and joy are probably the most commonly recurring themes in all the poems. Amber: Are you doing anything special to celebrate April as National Poetry Month? Connie: This two week blog book tour was planned to be a part of National Poetry Month. It also comes at a great time before Mother’s Day in May, which is a popular time for giving beautiful poetry gift books! Connie: I’d like to thank you, Amber, for helping me to share about my poetry books, and to invite the readers to visit my website, www.freewebs.com/conniearnold for further information and to read some poems. I look forward to reading and responding to the comments!